For over a decade Amy Schuber has been successfully coaching business owners on building, growing and sustaining a prosperous business while staying grounded and connected. Amy has learned success in business and life comes from not doing more but having a different approach, by being aligned, thoughtfully aware, engaged and connected to oneself and one’s mission on a deeper level. Amy has an innate ability to see client’s true potential and unlock the possibilities through providing solutions and resources unique to her client’s personal and professional needs and desires. She provides curated resources and solutions to expand & maximize life & business opportunities. Amy supports her clients in bringing their visions into reality. Vitale, Jen Sincero, John Lee Dumas, Mariel Hemingway and hundreds more who are making a difference with their work in the world. The goal is to produce thoughtful conversations based on conscious business, mind, body, spirit, and well-being in hopes to spark your heart and ignite your soul into a deep dive of self-discovery. 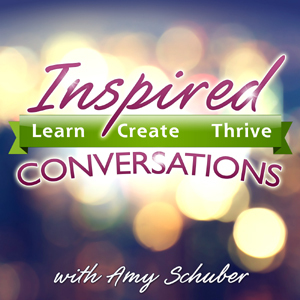 Amy intends for these conversations to inspire people to learn, create and thrive in their lives. With over half a million listens in over 100 countries and featured in iTunes New & Noteworthy Amy is well on her way. What are you looking for in a guest? I’m looking for guests who are forward thinkers and have a mission to make a positive impact on the world through their work. Thought leaders in their industries who can share tactics and strategies for personal development and business growth. Whether they are strategies to stay connected and grounded for conscious living or tactics to get out of our own way to build a productive and profitable business. Best advice to offer those looking at being a podcast guest: Being a podcast guest can be so much fun and the connections you make can be life changing. I’d say be clear and concise with your messaging and what you’d like to achieve with your interview prior to the interview and for the request for interview. Be prepared with whatever requests the host is asking of you, whether it be camera ready or in a quiet space. Take it seriously but also have fun. Be as supportive of the show you’re on as you are expecting them to be for you. The promotion goes both ways and it goes a long way to stay connected and be engaged.